When talking about South African food, traditional droëwors is one of the first things that springs to mind. The coriander-seed spiced dried sausages have always been a feast to the taste of food lovers. Try imagining going out on a picnic or a road trip without droëwors sandwich supplies and you will fail. Making your own droëwors, however, could turn to be a bit of a challenge for those unaware of its specifics. Why don’t you test culinary skills and treat your loved ones with homemade droëwors. As challenging as it may appear, it will also turn out to be rewarding… and delicious. 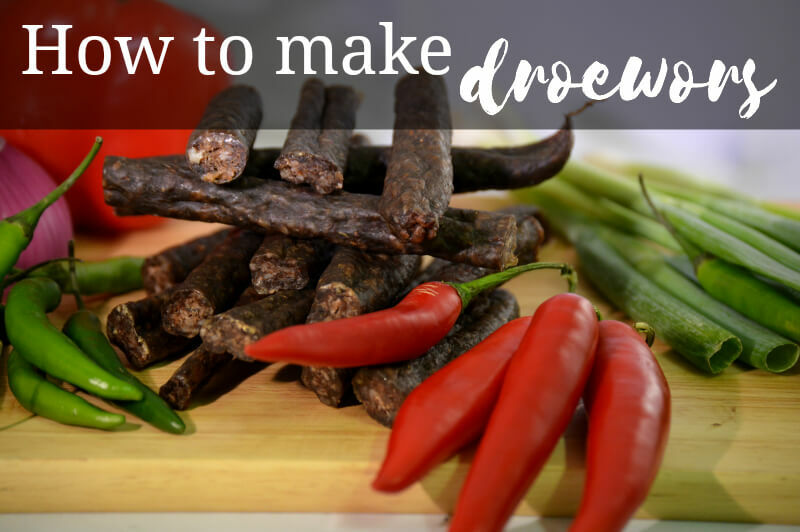 This is our take on how to make droëwors. Never forget that good droëwors is made from very lean beef so it doesn’t turn greasy and limp. Meat is paramount to droëwors. What you need is 3 kg of lean beef or lamb. Do not use pork or veal because it goes rancid. The other ingredients include 300 gr of fat, some natural sheep casings and a mix of spices. That last bit is open for improvisations. Use coriander, cloves, nutmeg and black pepper in any proportion you like. Mix together the meat and the fat. The less fat you use, the leaner wors will be. But if you use too little fat, the droëwors could become dry. Pre-cool the mixture at 2 C.
Mince the meat and add spices to the mix. Put it in the fridge for 3 hours so the spices can sink in. Mix again and then mince again this time through 4.5 mm plate on mincer. Fill the sheep casings with the mixture without letting any air in. Dry the droëwors at 30 C with UV light for 24 hours. Then switch off the light. Hang droëwors to dry on a plastic or metal hook. Do not allow contact between the raw meat and wood. Dry droëwors for 5 days. A traditional recipe combined with quality ingredients and a bit a skill will give you the best droëwors. For those curious to know we can reveal that the delicacy roots date as far back in time as 17th century. This was the time when Dutch settlers in South Africa started following recipes for preserving meat. It is believed that those recipes come from the ancient Incas in South America. And what a tasty heritage they have left us! Finally, don’t despair if your droëwors don’t come out perfect at the first attempt. Remember, we at St Marcus Fine Food are always here to treat you with our droëwors perfection. You can find out more about St Marcus droëwors here.